Do you want to grow beautiful plants indoors, but don’t have enough natural light to do so? Are you eager to add some beautiful, fresh green to your home without most of the hassle? The LED grow light! Just as Good as Natural Sunlight! 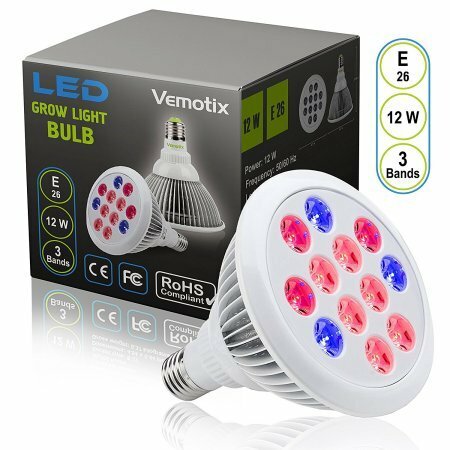 With the special design of the LED grow light, you get the right amount of blue and red light that every plant gets from the sun, ensuring that 2-3 plants grow just as well inside your home or office from seed to grower. Amazingly Durable. The professional design of our grow light ensures that you won’t have to switch it anytime soon. One lamp can last you for decades! Your Satisfaction is Guaranteed! You will love our LED grow light or get all your money back. Just as simple as that. Take advantage of our special offer NOW and see your plant grow strong and beautiful inside your living space! TRULY 12W LED KEEP YOUR PLANTS HAPPY AND HEALTHY. The professional design of our (12W) LED grow light ensures that your plants won't burn or get damaged by the strength of the light. SEEKING THAT PERFECT 'NATURAL" SUMMER THROUGH WINTER? Our LED grow light has exactly the right frequency blue and red lights to help your plant grow from seed. WASTING MONEY AND SPACE? USE THIS LAMP FOR MULTIPLE PLANTS! One lamp can grow up to THREE average sized plants at the same time, saving you money and space, while being just as effective as sunlight. NEED A LAMP TO LAST (PRACTICALLY) FOREVER? No more wasting time with returns. One LED light will last you for years, ensuring that you get more value for your money than any other lamp of its category can give. WORRIED? DON'T BE! WE OFFER YOU A 100% SATISFACTION GUARANTEE. We guarantee that you'll be amazed by the quality of our product, or you'll get a full refund. Take advantage of our special, risk free offer NOW and watch your plants grow healthy and strong. If you have any questions about this product by Vemotix, contact us by completing and submitting the form below. If you are looking for a specif part number, please include it with your message.